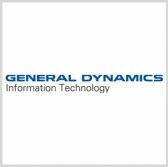 A business unit of General Dynamics has won a potential $52 million contract from the U.S. Navy to support cybersecurity and information technology programs at the Naval Meteorology and Oceanography Command. General Dynamics Information Technology will also provide subject matter expertise on IT architecture and engineering as well as meteorology, oceanographic and geospatial data systems to NMOC and other subordinate commands of the Naval Information Forces Command, the Defense Department said Thursday. The indefinite-delivery/indefinite-quantity contract has an ordering period of five years worth $47.1 million and a six-month option that could extend work through October 2022. GDIT will perform work Virginia, California and at the Stennis Space Center in Mississippi. The Navy received three offers for the contract via a solicitation on FedBizOpps and obligated $5,000 in fiscal 2017 operations and maintenance funds at the time of award.